Each weekday before the DCI 2005 Classic Countdown, we'll be running first-person accounts of the seasons and the shows that will be featured in that event. Here's the third installment: By Mark Whisenant 1980 Spirit was a triumph and a heartbreak. That summer included the greatest and the saddest moments in many young lives. For some, those superlatives live on to this day. Early Spirit was a journey of becoming something wonderful at an amazing rate of speed. The original 1977 members that remained were on the ride of their lives. After only a year of struggle, success had rained upon us in buckets. Members joining in subsequent years must've been even more amazed at how quickly good things were happening to us. Spirit of Atlanta in 1980. Spring of 1980 had to be one of the happiest times of my life. 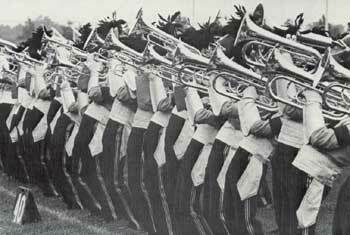 We thought we might have finished a little higher in 1979, but hey, being in head-to-head competition with the Santa Clara Vanguard is a thrill and an honor whatever the outcome. But getting ready for 1980, we were relaxed and confident. Tom Float must've known that he was going to make a run at the drum title. He'd been there before and he knew what he had. Spirit drummers were Float drummers. They believed in him 100 percent. And likewise, Spirit brass players were Ott brass players. We'd already had a taste of the big time, losing field brass to Phantom by .05 in 1978 finals (Jim's first year with us). The affection between Jim Ott and his 62 students in the brass line was a life-defining experience. The only downside to that relationship was that it could not last forever, and it could not be replaced. But we did not know that. Yet. Jim died on tour in an accident due to equipment failure. Our world shifted in a fundamental way. To the extent that we ceased to be children, it never shifted back. We had about a week of first tour left, then we went home for a while (remember when corps had two tours with a break in between?). Into the breach stepped Freddy Martin, corps director and founder. He had recently stepped back from an instructional role. Freddy gathered us up, and took us home. Then he led us to World Championships. It was his finest hour. Back in Atlanta, we cleaned up the show and became infused with our new mission. We had to put on the black armbands, go out, and show who we were. We had to put the final touch on the career of a great man, and redefine Spirit as a survivor, not a flash in the pan. One of my most vivid memories of the 1980 season was opening second tour in Stillwater, Minn. It was the old-style bleachers, and we did two shows in two nights so all the people could get in to see. Amazing as it seems now, we had not played "Georgia" first tour. But we had put it back in at the beginning of the show, and had moved the brass line front and center. So during Joel Schultz's mellow solo, we wound around nice and easy to the front sideline, turned to the crowd, and let loose with the impact. I will never forget the physical reaction of the crowd, 20 feet in front of us. They jumped back in their seats. From where we were, we could make eye contact with the people and see their faces, and they could see ours. Anyone who saw us from then on could never doubt that we were on a mission. For our young hearts, I can only describe it as a catharsis. Ending the year in Birmingham, Ala., was a thrill and a relief. To have come within .8 of the title was an honor. To see our drums tie for the drum championship was a validation. Our guard performed as they never had before. For the brass line, it was an homage and a prayer. So when you see 1980 Spirit in the theater, please remember that you are seeing and hearing something more than the culmination of a successful season. You are witnessing the raw emotion of 128 young people, reaching out to you from 25 years ago. Thank you for remembering and letting the moment live on. Go Spirit!